My name is Ed Bolian and I am a car guy. If that sounds like the opening to a support group discussion then that is probably a good thing. It is an addiction that seems to have no cure. Fortunately I have found the best way to exercise that demon and scratch the itch – I am the Lamborghini Sales Director at Motorcars of Georgia. I came on here in October of 2009 and have really enjoyed getting involved with our local community of owners and finding new ways for everyone to use and enjoy their cars. We regularly attend shows, host events, and go on mountain drives around the metro Atlanta area. If you are a Lamborghini owner then we want to hear from you if we don’t already see you regularly. If you are simply an enthusiast and “future owner” then we want to know you as well. Stay in touch with us and follow along with our activities and photo galleries here. 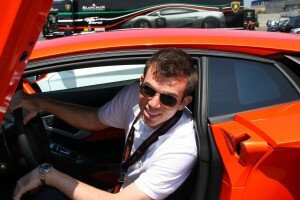 On this site you will find a lot of fun and interesting information about me and about Lamborghini Atlanta. I will post pictures of our events and frequent activities for everyone to see. I will post some videos and information about new and upcoming models and try to keep everyone in the loop regarding everything that is going on at Lamborghini. It is a great pleasure to be involved with such an exciting and innovative brand. Thank you so much for reading and please feel free to comment and contribute as you wish.